Bedtime: Create a nook for a comfy bed in an alcove or in the space under a stairwell. A cozy, built-in space will make your pet feel safe and secure, and it will look much tidier than the dog or cat bed lying in the middle of the living room floor. If your pet is getting older, include accessibility into your design. Ramps and long, low-rise steps will be a big help if a sofa or bed is your pet’s favorite sleeping spot. Supper time: When remodeling the kitchen, include a cabinet dedicated to pet supplies. Organize the space to corral food, treats, medicines, etc. Incorporate a shallow drawer that pulls out to reveal water and food bowls. A pet-sized water fountain can also be installed by connecting it directly to the home water line. Play time: The mudroom or entry can include space for leashes, toys, balls, and cotton towels for wiping muddy paws. Hooks, cubbies, drawers, or shelves will neatly organize your pet’s outdoor gear. Think about floor and wall coverings that can withstand splattering if your dog has a good shake after coming in from the rain. For indoor fun, especially for cats, install an elevated cat window seat for gazing outside. Specialty “furniture” can also be installed that provides a safe place for cats to jump and climb. Bath time: A pet-washing station can be part of the laundry room or mudroom. Choose flooring that is easy to clean and that can get wet. A laundry sink, a low shower with a hand-held shower head and a floor drain, or a raised tub with a ramp will make bathing easier. Consider commercial-grade pet dryers to expedite the task. Make sure to include dedicated space for grooming supplies. 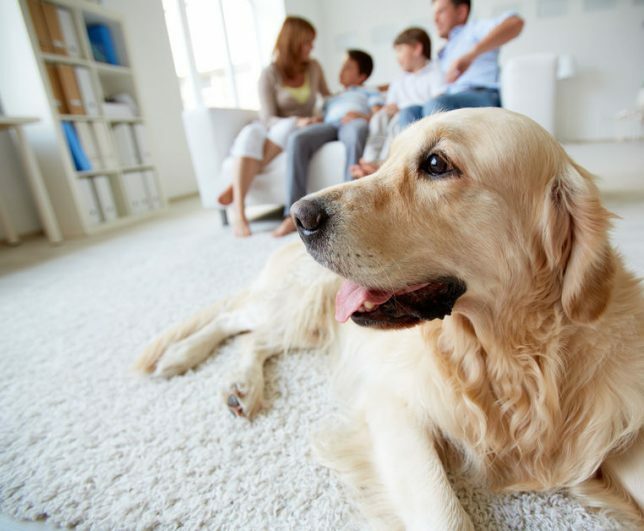 To help keep your home clean between your pet’s baths, try a central vacuum system to deal with all that hair and fur and washable slipcovers for upholstered furniture. Also think about new flooring choices that can resist scratches and stains, such as hardwood or laminate with a hard coating. Alone time: There will be times when your pet is home alone without you. Have a comfortable space for them to spend that time – perhaps a screened porch or sunroom where they can get natural light and observe the world outside. Include a comfortable spot for napping. Tile flooring is cool in the summer and can be outfitted with radiant heat to keep them warm in the winter months. Safety gates, which are now available in a range of styles and materials, might be a good idea for dogs prone to mischief when left on their own. A dog run for nice weather is another touch that can be included into your outdoor scheme. Time to get down to business: A pet door allows your dog and cat the freedom of letting themselves in and out of the house. This frees you from dashing home to let your dog out or from having to hire a pet sitter. Along with making your pet more comfortable, a pet door allows more opportunities for exercise and a way to come in out of bad weather. For your indoor cat, build in an out-of-the-way spot for the litter box, perhaps in the laundry room or an extra bathroom. It can be cleverly hidden in an open cabinet shielded by a curtain. Planning a home remodeling project? Call in an expert. Make sure your newly remodeled space will work for your family, pets and guests with professional help from a qualified remodeling contractor. We make finding a pre-qualified pro easy with our contractor matching service. Just enter your ZIP code above and you’ll hear back from a contractor in your area whose qualifications have already been vetted, and whose workmanship is warrantied for a full three years.